The Monongahela River meanders from the West Virginia coal country to the middle of Pittsburgh, where it joins the Allegheny River to form the Ohio, a famous confluence called Three Rivers. Along the way the river curls around this hill and that, forming elbows and horseshoes that can make travel between towns along its banks long and lonely. Along one of those curves, a large horseshoe about 30 miles due south of Pittsburgh, lies a a town called Donora, an old mill town that would largely be forgotten now were it not for an unusually long patch of unlucky weather that led to the deaths of hundreds of people and ultimately prompted the creation of the Clean Air Act. For it was at that horseshoe curve that at the turn of the 20th century a wealthy Indiana industrialist, William H. Donner, and his famous boss, Andrew W. Mellon, had decided to build a series of steel plants to supply the growing needs of a flowering America. 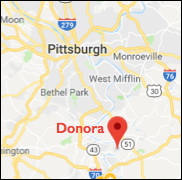 The plants employed thousands of Donora residents, supplied steel and wiring for hundreds of buildings, bridges, and highways, and spewed untold tons of respiratory pollutants and irritants into the air. In the fall of 1948 Mr. Donner’s plants gave grave notice to the town that all was not well. On the worst day, Saturday the 30th, two brave volunteer firefighters, Bill Schempp and Jim Glaros, worked their way around town, each feeling his way from house to house to deliver oxygen to residents with respiratory problems. Each visit lasted only a few minutes and happened the same way. The firefighter placed a mask on someone struggling to breathe and turned the oxygen on for just a few seconds, what they called a “shot of oxygen.” Just as the person began to breathe more easily, the firefighter then moved to the next house. The residents needed continuous oxygen but there simply weren’t enough oxygen tanks to go around. “These people were just desperate for air,” said historian Brian Charlton, curator of the Donora Smog Museum and active member of the Donora Historical Society. So it was that two firefighters, men who had lived and worked with the people of Donora for years, who had fought fires, transported the sick and injured to local hospitals, and plucked frightened cats from raging storm drains, had to decide how much oxygen to give each resident. They had to say over and over, No, I’m sorry, as they shut off the oxygen and removed the mask. They had to listen to those desperately ill people plead with them, begging for their life, and then these volunteers had to walk away knowing they might never see their friends alive again. All told about 20 people would die over that six-day period, at least 50 more the following month, and hundreds more over the following years. The event spurred an investigation by the Division of Industrial Hygiene, then part of the U.S. Department of Public Health and now part of the Environmental Protection Agency. After numerous states, including Pennsylvania, enacted their own clean air acts, the Government decided that clean air should be a national priority and in 1955 passed the first national air pollution law, initially called the Air Pollution Control Act of 1955 (public law 84–159), later renamed the Clean Air Act.